Tufloc 62-000 Single M16/AR15 Gun Rack FREE SHIPPING! 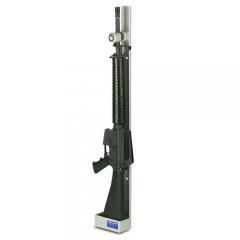 Keep firearms safe and secure with the Single M16/AR15 Gun Rack from Tufloc. The custom rack secures with Tufloc's proprietary locking system, implementing Medeco's high-security cylinders to secure weapons with a full stock. Once an AR15 or M16 is locked into position, it is virtually impossible to remove without rendering the firearm useless. The durable rack is constructed of heavy-gauge, powder-coated steel for additional security. Tufloc is a major provider of gun racks and locking systems for law enforcement and the U.S. Government. NOTE: Allow 4-6 weeks for delivery of the custom-made special order. ©2002-2019 CopsPlus.com: Tufloc 62-000 Single M16/AR15 Gun Rack FREE SHIPPING!